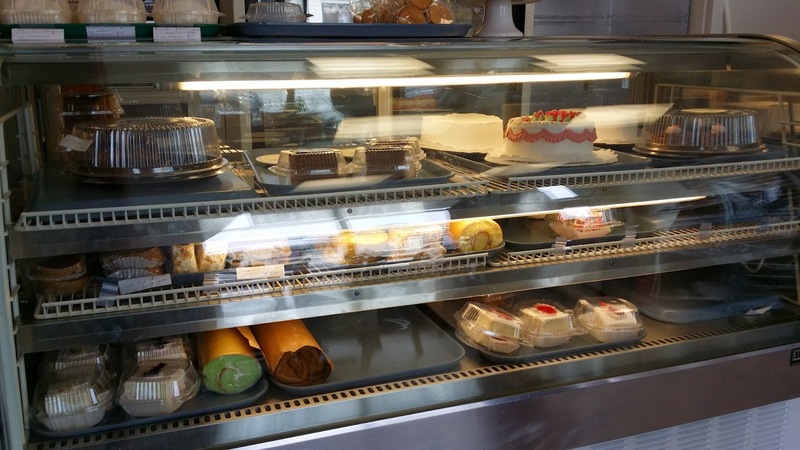 Mami-Eggroll: Green Forest Tea House 1, New Chinese Bakery in Lowell! Green Forest Tea House 1, New Chinese Bakery in Lowell! A few weeks ago, the Mo picked up Chinese Takeout at China Star on Broadway St. and noticed a new Chinese bakery that opened up next door. The Green Forest Tea House opened its doors last Fall on 38 Willie Street and shares the same building as the popular take-out Chinese restaurant. We arrived on a Saturday night after 6 PM during the Chinese and Vietnamese New Years weekend so I didn't have great expectations for what would be left. 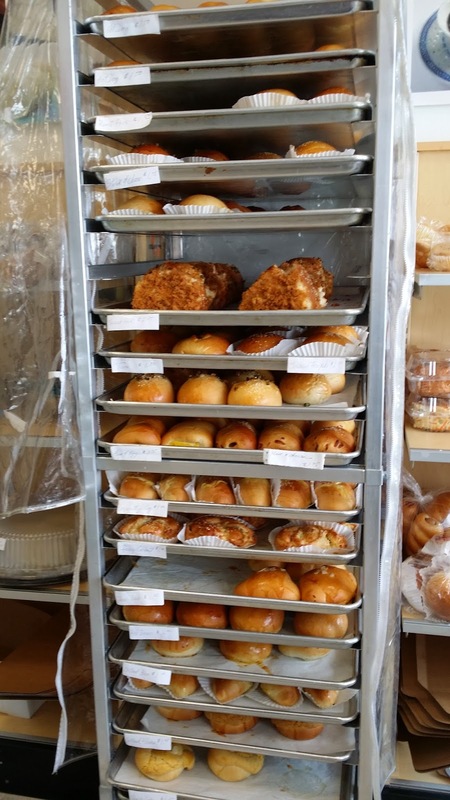 Everyone knows that you have to get to a Chinese bakery early in the morning for the freshness and availability of all their wonderful delights. Similar to its only other competition in Lowell, (Chiu Yeung on Highland St), the bakery is small with a couple of tables. There was an open spaced "kitchen" area for their limited "take out" food area that cooked Chinese congee rice porridge and Yaki Soba noodles. The blenders were used to make smoothies and other drinks. The dessert/cake display case left much to be desired. Again, it could have been that we arrived later in the day but it didn't seem like there was anything pleasing to the eye. Usually I get super excited and over order the typical Chinese sweet treats and end up with a box full of green tea cakes, sponge fruit cakes, mango custard, and sweet rice cakes. I didn't care for anything here except something called the "Triple" baked bun with was three separate baked buns stuck together with custard, taro and red bean filling. The baked buns are displayed on a rolling bakery cart with each group of buns labeled accordingly. There was a great variety of baked buns that included taro, tuna, hotdog, pork, and one that I've never seen before, "Steak & Cheese." We had to get one to try. Prices were a little higher than the usual Chinatown fare at $1.50 or $ 1.75 for most of the baked buns. I saw that there were some refrigerated steamed buns in the fridge behind the counter and I was a bit disappointed that there were not hot ones. I asked anyway, just to be sure, and the young man advised that they are steamed in small batches and pointed me to the hot ones on the counter. I was happy again! The buns were ginormous. At the time, they had regular pork and pork with vermicilli noodles for $2.50 each. The Mo and I split a regular steamed pork bun that was filled with the usual pork filling, hard boiled egg and Chinese sausage that is common among all baos. I'm not sure if it's because we were already ravenous, but the pork bao was pretty good. I'd definitely get another one. The steak and cheese bun was filed with shaved steak, green bell peppers and onions. 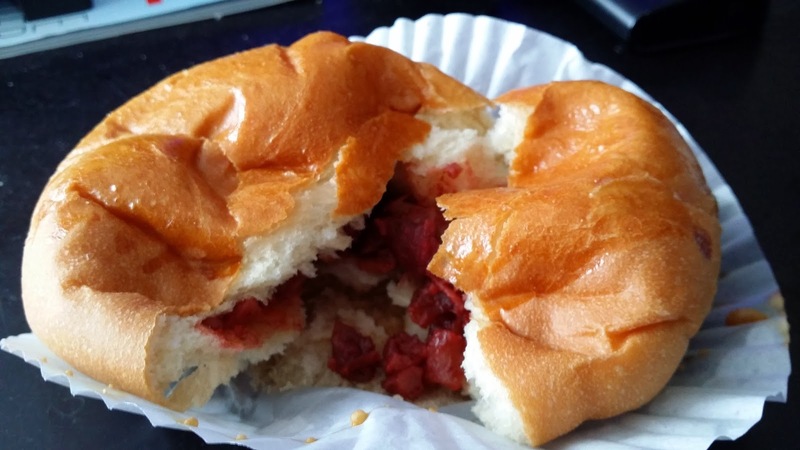 I really liked the curry beef bun, my mouth was exploding with flavors but the filling was on the lighter side. I wished they had filled the bun more. We went back on a Saturday morning to order a birthday cake for my mother and there much more treats! We met the owners and they were extremely nice and friendly. The woman even insisted if we didn't like anything, to bring and back and she will make us a new one. The Mo got a roast pork bun and chicken terriyaki bun that he really liked. We ordered a cake for my mother's birthday. It was half Durian/Taro on one side and fruit cake on the other side. I thought the durian / taro combo was a bit too much. We should have stuck to one flavor.